The International Coral Reef Initiative (ICRI), through its Regional Lionfish Committee with SPAW-RAC, is urging Caribbean countries to adopt a regional roadmap to control the invasive lionfish. Regional Lionfish Committee co-chair and lead author Ricardo Gomez Lozano said a Regional Strategy for the Control of Invasive Lionfish in the Wider Caribbean had been developed to help control the introduced reef pest. “The strategy outlines specific actions and encourages transnational collaboration because we believe that by pooling efforts and resources, lionfish control efforts by Caribbean countries can be more efficient,” Mr Gomez Lozano said. “We urge decision-makers, but also marine managers, researchers, fishers, divers and educators to use this Regional Strategy as a guide to develop national strategies and local management plans. We all have a role to play in ensuring that local and regional action to control lionfish makes a real difference to our reef ecosystems”. 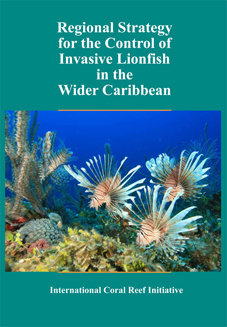 James Morris, ecologist for NOAA (USA) and co-author of the strategy, said lionfish, while native to Indo-Pacific coral reef ecosystems, were an introduced pest in the Caribbean. “They were never in the Caribbean but are now widespread across the region and represent a serious threat because they cause extreme disruption to native fish communities, reduce reef biodiversity and hinder stock-rebuilding efforts for commercially important fish species”. Belize Fisheries Administrator and ICRI Co-chair Beverly Wade said the Strategy would complement the lionfish guide previously released by the Regional Lionfish Committee. “Everyone has limited resources, but given the urgency for action and the seriousness of the threat it represents – not only to the integrity of the reef food web but also to important industries such as fisheries and tourism - we can’t afford to get it wrong. This new strategy will hopefully help direct resources where they are most needed”, said Ms Wade. The Strategy is distributed in three languages throughout the Caribbean.